At Optima Accountancy Services we believe in giving you a transparent pricing structure tailored to your individual requirements. By discussing the needs of your business we can put together a quote, based on the services below, so you know not only exactly what services you can expect from us but also the cost of each of those services. Included in each of these packages are unlimited general telephone and email queries and up to two meetings a year at no extra cost. Any additional work that is required from time to time will be quoted for in advance so you have the peace of mind that no unexpected bills will land on your desk. Preparation of return and calculation of tax liability. Filing with HM Revenue & Customs. Preparation of partnership tax return & filing with HMR&C. Preparation of personal self assessment tax returns. Preparation and filing of personal self assessment tax return. Preparation of annual accounts & filing with HMR&C and Companies House. Preparation of corporation tax return and filing with HMR&C. Calculation of corporation tax liabilities. Preparation and filing of annual return. Preparation of minutes and resolutions. Registering the company at Companies House. Advising on directors and shareholdings. Completion of all statutory forms. Preparation and review of accounts on a monthly, quarterly or half yearly basis. 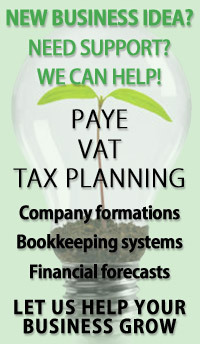 Bookkeeping services can be provided tailored to your individual business requirements. These can either take place in house or at our business premises. Preparation of returns and filing with HMR&C. Preparation of payroll on a weekly or monthly basis. Dealing with monthly or quarterly returns. This is not an exhaustive list of services and we would be happy to discuss any additional requirements you may have.